We often roll our eyes at the cliché phrase “It’s not you, it’s me,” mostly because it’s used to end one-sided relationships in various forms of media. It’s shorthand for a slew of problems couples face—infidelity, lack of interest, poor communication—and it feels disingenuous because we’ve heard it so many times. But as much as I don’t like using it, I’m going to break my own personal rule today and say this: it’s not you, Dark of the West, it’s me. The debut novel from Canadian-born Minnesota author Joanna Hathaway, the first in the Glass Alliance series, tells the story of two teenagers caught in the midst of political alliances and looming war. Athan Dakar, the son of a ruthless general, is training to become a pilot, a soldier his father can use to take down enemies. Aurelia Isendare is a princess with hardly any knowledge of the state of things, constantly questioning her allegiances to her own family. When Athan’s mother is murdered, his father immediately points the blame to Aurelia’s mother and enlists Athan to garner information from Aurelia. The two meet, fall in love, and realize how difficult it can be to tell truth from fiction when it comes to warfare. Going in, I was intrigued by the star-crossed lovers angle (a guilty pleasure of mine) and the fact Dark of the West takes place in a fantasy world of sorts. While there’s no magic involved, modern technology from the World Wars does exist, giving off a steampunk vibe with an updated twist. It’s very clear to me that Hathaway is a history buff and did extensive research about planes used during that time period; it pays off during the scenes in which Athan pilots his fighter plane, making them some of the most exciting points in the narrative. The characters were all very complex and morally gray, which I feel is important in stories like this. Athan’s father, General Dakar, is definitely one of the main villains of the piece, but he has a moment early on when he drunkenly lets his guard down and shows Athan a softer side of himself. Similarly, Athan’s older brother Arrin appears to be a stereotypical womanizer with a cocky attitude, but he has hidden depths as well, to the point where I was left speechless with his decisions and actions concerning a rival nation. Athan and Aurelia are the emotional center of the story, wishing the world didn’t have to be so dark and cruel. They find solace in each other, each a confidant with whom the other can share their thoughts about the encroaching war and their worries about what that might mean for the state of their lives. Their relationship definitely doesn’t start with insta-love (thank goodness), but it does develop quickly, and I would have liked a little more time spent on that. They definitely had very sweet and intimate moments together, and, as a hopeless romantic, I would have loved to see more of them. So, does this mean Dark of the West is a bad book? Of course not. It’s developed a fan following even before publication day, and anyone looking for a unique fantasy story will not be disappointed. It’s well written, thoroughly crafted, and makes for a reading experience I can confidently say I’ve never had before. It just happened to be frustrating for me personally, but that doesn’t mean I have any bad feelings about it. I can appreciate it for what it is, even if it wasn’t the book for me. So, Dark of the West, it’s not you, it’s me. And that’s not on you. 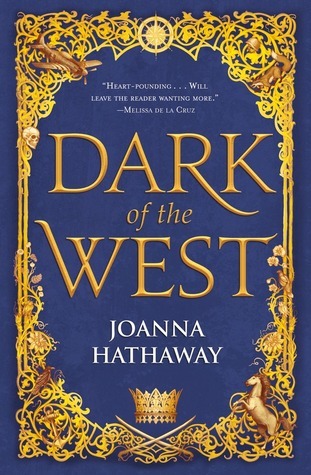 Dark of the West is out on February 5, 2019, and Joanna Hathaway will be appearing at a book launch at Red Balloon Bookshop in St. Paul on that day. You can also download a free preview of the book on the author’s website. History and fantasy fans, you’ll want to check this one out.